Bolton have signed centre-back David Wheater from Middlesbrough on a three-and-a-half-year deal. The 23-year-old is believed to have made the move for an initial £2.3m with a further £1.5m based on appearances. He added on the club website: "We want him to be involved at that level again and to do that he will have to play well for Bolton Wanderers, however, he has arrived here with a real desire to achieve that. Great bit of business for a talented young player. The signing comes after Andy O'Brien departed to Leeds on 1 January and could also be seen as a contingency plan if Trotters central defender Gary Cahill, who has been linked with several Premier League clubs, leaves. 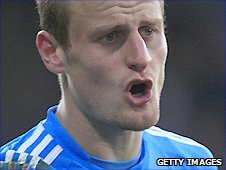 Wheater, who would have been out of contract in June, came through the ranks at Boro and made his debut for the club in March 2005. He has top-flight experience having become a first-team regular in 2007/2008 when the Teesside outfit were in the Premier League before they were relegated to the Championship in 2009. "I met with the manager and we had a good chat about football," the former England Under-21 international, who made 154 appearances and scored 10 goals for Boro, told the Bolton website. "I had a look around the facilities and it was a really easy decision to make.